Product #60816 | SKU P133-9HSD | 0.0 (no ratings yet) Thanks for your rating! Featuring a full-HD IPS LCD panel, it can be used for HD as well as SD workflows in studio, broadcast, and other professional video applications. The FeelWorld P133-9HSD 13.3" Broadcast IPS LCD Monitor has been widely used in TV news production, broadcasting house, TV broadcasting trucks, and other fields. Since this series works with other adjacent professional equipments, high stability, high reliability and electromagnetic compatibility are very important to make sure the whole system works smoothly. The full aluminium case not only makes the product more solid and durable, but also solves the problem of heat dissipation. The full aluminium case also improves the anti-interference capability. 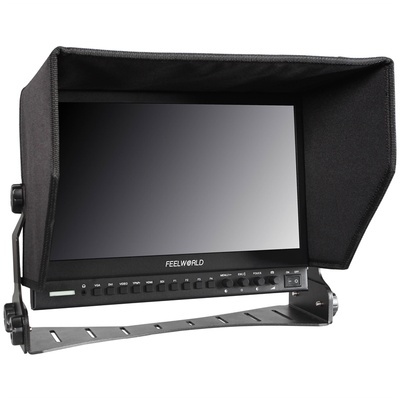 This monitor is ideal for high end broadcast monitoring because it features high quality focus assist function, check field, image freeze, image flip, centre marker, safe frame, colour temperature adjust, which assists users to accurately monitor when shooting, making and playing movies/videos.